Ross & Wye Courts occupy a prominent position at the top of Castlebar Hill, within the renowned Cleveland estate, bordered by Cleveland Road to the south, Kent Avenue to the west, Kent Gardens to the east and Scotch Common to the north. Cleveland Park lies immediately to the west of Kent Avenue and the estate lies approximately 1 mile to the north west of Ealing Broadway. Ross Court is approached via Templewood, a turning off Cleveland Road, and right into Malvern Way, a small cul-de-sac serving Ross and Wye Courts, tucked into the south east corner of the estate. First Great Western Service at Ealing Broadway Station provides fast (10 minutes) access to Paddington and Heathrow Connect provides a frequent 20 minute service to Heathrow. Access to the West End (30 minutes) and the City (40 minutes) via the Central Line underground and Earls Court, Victoria etc via the District Line. The Cleveland estate was constructed over several years in stages from 1965 to 1971 by renowned international local based builder Haymills Limited. The entire site was originally occupied by a large mansion and grounds which subsequently became allotments after 1945. The buildings are of pleasing brick design with the majority of flats benefiting from south facing balconies. Twenty-two apartments are arranged over four floors in both blocks. The main entrances, and staircases are of generous proportions and security is provided by the installation of entry phone system. Ross & Wye Courts are set amongst mature landscaped grounds, with mature trees, shrubs and lawn to the front and sides of the building. There are two main entrances into the building, with access direct off Cleveland Road. All flats have the facility of either a lock up garage or car parking space. Each apartment is held on a lease for a term of 125 years from 25th June 1964. 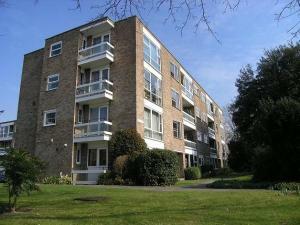 The residents' management company "Ross and Wye Court (Ealing) Ltd" (in which all leaseholders hold a share) purchased the freehold interest on 22 October 1991.